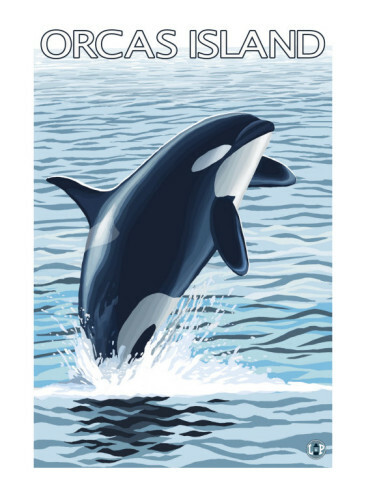 Anyone might expect Orcas Island is named after its biggest tourist attraction, the presence of three resident pods of killer whales. Not so. Back in 1791, it was named by a passing Spanish seafaring explorer in honour of the Viceroy of New Spain (Mexico), a grandee with the suitably magnificent moniker of Don Juan Vicente de Güemes Pacheco de Padilla y Horcasitas. Orcas is the largest and most mountainous of the San Juan Islands. These islands are part of a Pacific Northwest archipelago of more than 700 islands and reefs sprinkled across the lower end of Georgia Strait, immediately south of the US-Canadian border. 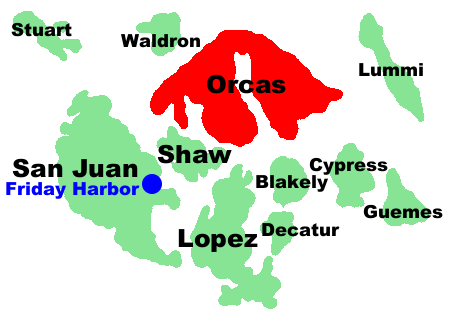 The four main San Juan islands are Lopez, Orcas, San Juan and Shaw. To reach Orcas, I take an exhilarating scenic flight north-west from Seattle in a Cessna 180 which, after about an hour in the air, dips suddenly toward the ocean, skims the choppy surface of Cascade Bay and touches down in front of Rosario, once a family mansion and now a resort hotel. Rosario was built in the early 1900s by Robert Moran, a wealthy Seattle shipbuilder who, aged 48, was given only a year to live so he moved to Orcas to build his dream home. Moran lived to be 86 and the “Moran maxim” of a peaceful, stress-free existence still holds sway on the island. The main San Juan attractions are unspoilt nature, relaxation and wildlife. Orcas (think Free Willy) are the largest members of the porpoise family. The three resident pods, known as J, K and L, together number about 80. And transient orca also visit these waters, which means the chances of close orca encounters are excellent between May and September. It’s also possible you might see minke whale, Dall porpoise, harbour seals and, overhead, great blue herons and soaring bald eagles. Orcas is a staging post for migratory birds with the prime spot for serious twitching being along the lake shores in Moran State Park, where you may just be lucky enough to also glimpse a reclusive black tail deer. The main island village Eastsound has a Saturday Farmers Market between May and September. It’s the ideal place to mingle with locals and discover what’s cooking and what’s locally grown. Shuttle buses, taxis and hire cars are available as well as bikes for hire. A real challenge, should you wish it, is riding to the summit of Mount Constitution – at 734 metres the highest point in the islands. Less exhausting activities include “jigging” for crabs, “dipping” for shrimp, digging up clams at low tide and collecting mussels and oysters. Anglers attempt to catch salmon, trout and bass. Other sportive pursuits include sea kayaking and horse riding. Moran State Park has 60 kilometres of trails for walking and mountain biking. Alternatively, the Washington State Ferry stops at Orcas Island on its way to Friday Harbor on San Juan Island.